Talmudist at Arles, in the Provence, probably in the second half of the fifteenth century. He wrote the following works: (1) An index of all the Biblical passages cited in the Babylonian Talmud, including the "minor treatises," and the Abot de-Rabbi Nathan, with a list of the passages in which they are cited. A later copyist gave the work the name "Em le-Miḳra" (Scriptural Sources). It is manuscript No. 1637, 3, of Neubauer, "Cat. Bodl. Hebr. MSS.," and occurs also in a Verona manuscript. 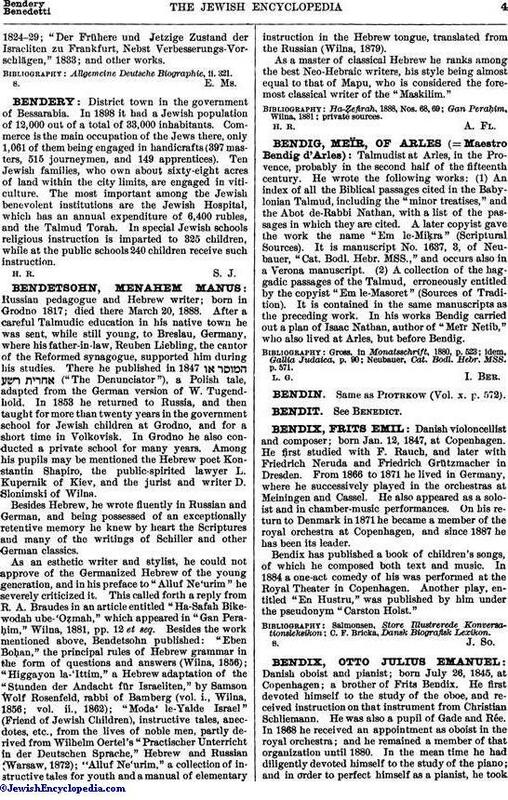 (2) A collection of the haggadic passages of the Talmud, erroneously entitled by the copyist "Em le-Masoret" (Sources of Tradition). It is contained in the same manuscripts as the preceding work. In his works Bendig carried out a plan of Isaac Nathan, author of "Meïr Netib," who also lived at Arles, but before Bendig. Neubauer, Cat. Bodl. Hebr. MSS. p. 571.